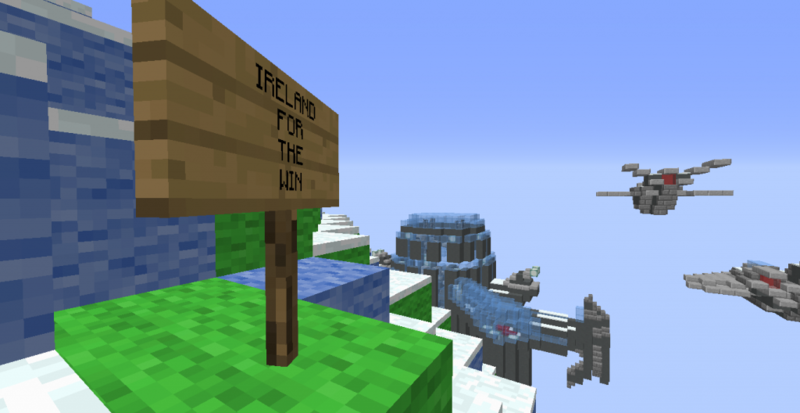 In the summer of 2015, during a number of sessions of our cccSkerries Minecraft Club, Eoin (age 10) used the time to build something great. 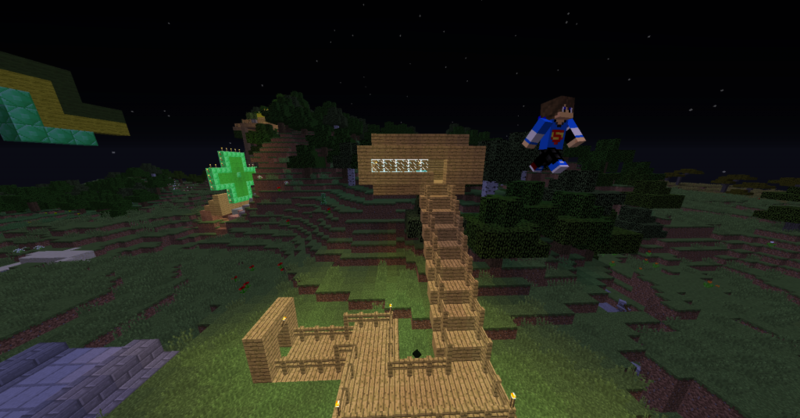 While the others were having adventures on our shared server, he created two space stations and four fighter planes. 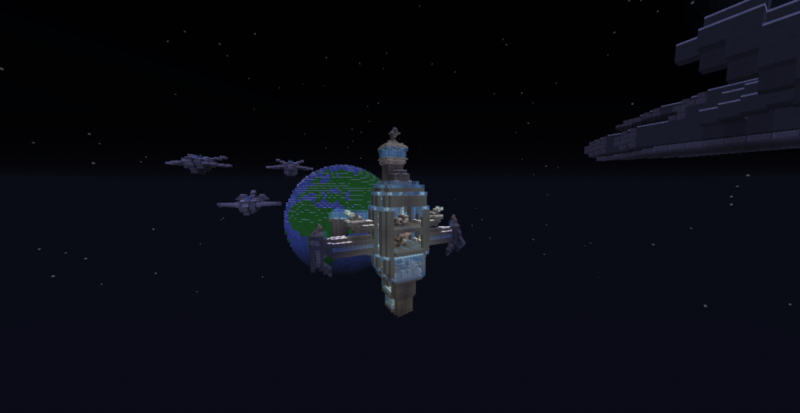 This was done for the 2015 EUMETSAT Learning Zone Minecraft Competition. EUMETSAT is the European Organisation for the Exploitation of Meteorological Satellites, and Ireland is one of its 30 member countries. We made a short video (just over four minutes) of his entry – hope you like it! PS: Unfortunately, the entry didn’t win a prize – but it’s still fantastic, don’t you think? The judges said: “It was a real challenge to evaluate the wide range of satellites from so many entrants as fairly as possible. 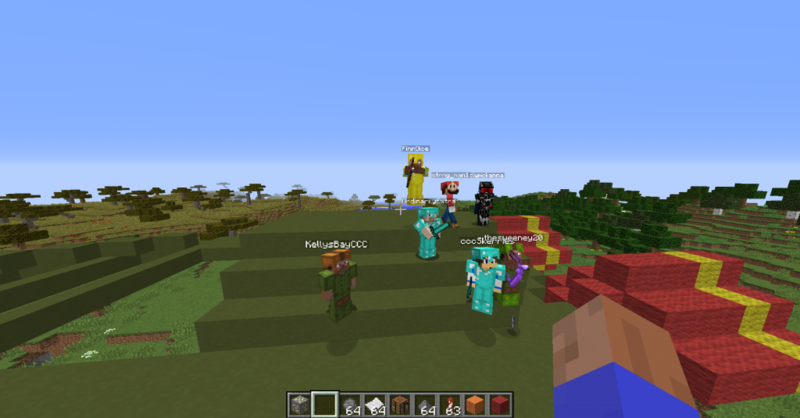 All of the designs were exceptional from their backgrounds, ideas and / or interpretations, to the amount of effort that went into them.” See the 2015 Learning Zone Minecraft Results page for the winners. PS: Wait for the page to load (might not work on a phone / tablet), then click into the project you’d like to watch or play. Enjoy! Click on the green flag and watch. “Arrows to move and space to jump. There may be a few glitches and only levels 1 and 2 are programmed. V.1.0: Added this game to Scratch. V0.6 added ak47 no more movement by arrow keys. 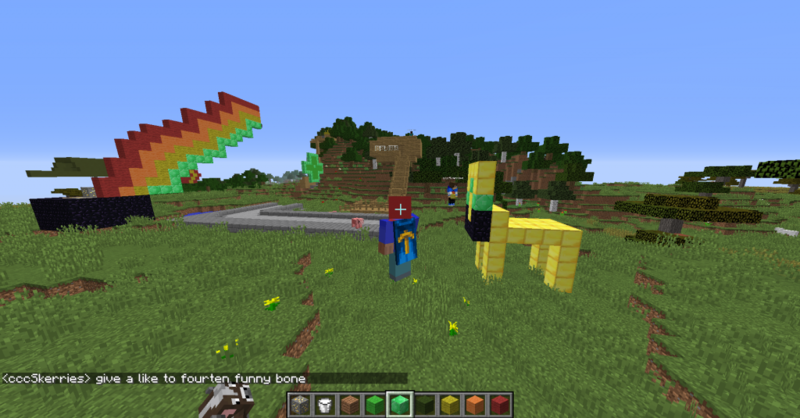 V0.5 Added stuff to randomize where everything spawns and i tried to add a AK47 but its pretty glitchy and you cant use it now i’ll try to get it to work. in the comments tell me what you want in the game. V0.2 Added more zombies and they can now die also changed the survivor to Santa Claus. V0.1 The game is made but nowhere near complete. 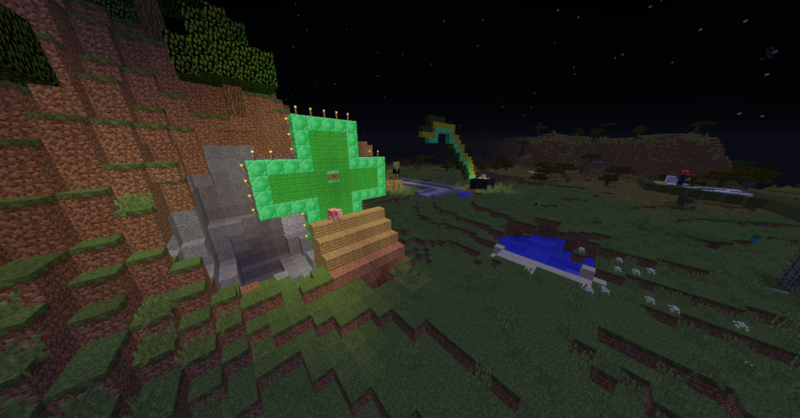 St Patrick’s Day… Minecraft Style! Did you ever want to make an animated Gif? You know, one of those pictures that move? Well, it’s not that hard at all – actually, it’s easy! Here is one I made in a few minutes – took some pictures with my phone, uploaded them to Giffysnap.Com as recommended on Razorsocial.Com, and here we go, my first ever gif! 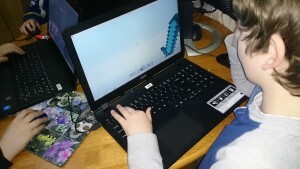 We’ve all seen it … once a kid is old enough to play computer games, the fascination grows and grows, and it sometimes seems very difficult to control their desire to immerse themselves fully in this virtual world. And this temptation will not get any smaller – just think what gadgets like the Oculus Rift will mean! One issue I have with too much computer interaction is that it makes you think that cause and effect are always clearly and logically linked. You click “print” – your document prints. You click “send” – your email wings its way to its recipient. 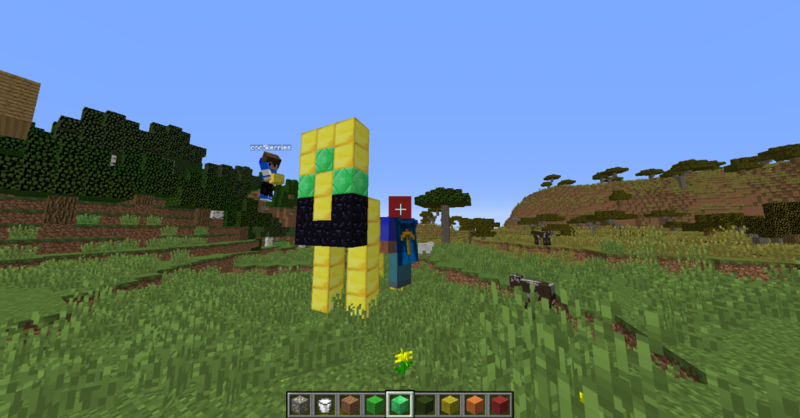 You tap your left mouse button – Minecraft Steve destroys a block of dirt; you tap your right mouse button – the same block is placed somewhere. And so on. Life is not like that. At least not for a lot of the time. You do A, B, C – and F happens, or maybe I, or X, but not D. You mention you’d like to go for a cuppa, and all of a sudden there’s a dozen of you in Olive’s. You had thought one or two others maybe! But that’s fine. You ask a friend a simple question, and they look at you funny, turn around and walk away. Leaving you baffled. But you can wait for an explanation – maybe something happened that you are not aware of. Learning to read people, learning to expect the unexpected and deal with it, is part of growing up. Too much of “I press X, then Y must happen” can make this realisation difficult for today’s youngsters. And this is where I see a possible role for multiplayer games. Via the internet (and – especially for younger children – hopefully well-monitored and with clear community guidelines), children interact online. 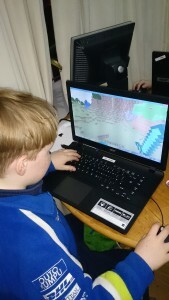 In our house, it was mainly Club Penguin at first, then Minecraft. 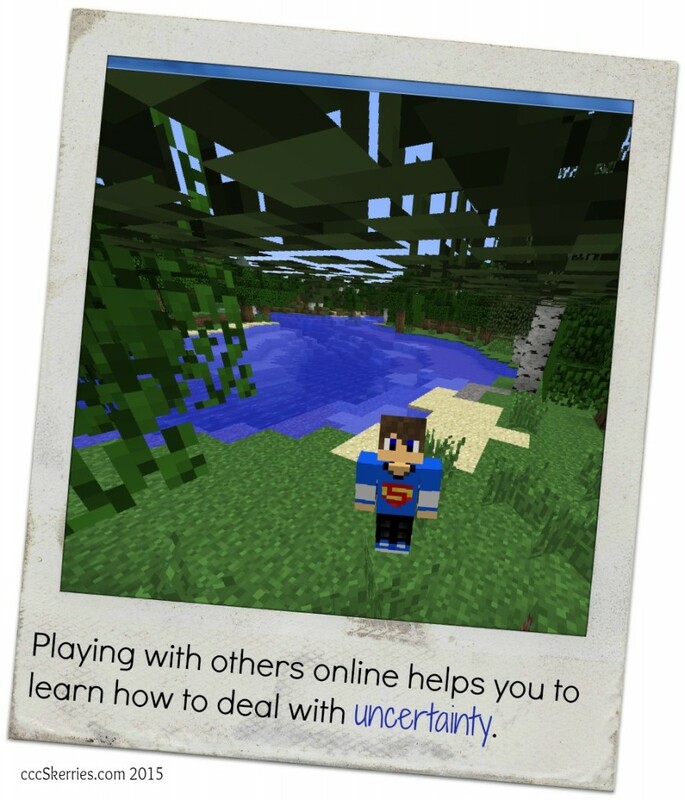 And it was not always sunshine and ice cream… at times, there were even tears when someone had promised to play together but didn’t show up, or when a Minecraft creation was accidentally destroyed by another player. But these things are good! They offer learning experiences. They help the child understand that if you do x, y does not always follow, and they help to learn how to deal with this fact. The way our children learn about the world is profoundly different from the way it was when we were young. It can be difficult to understand, even for someone with such an eager interest in all things digital (and such a drive to be playing when I can). There are dangers out there, and I will address how to do our best to keep them manageable in a future blog post. 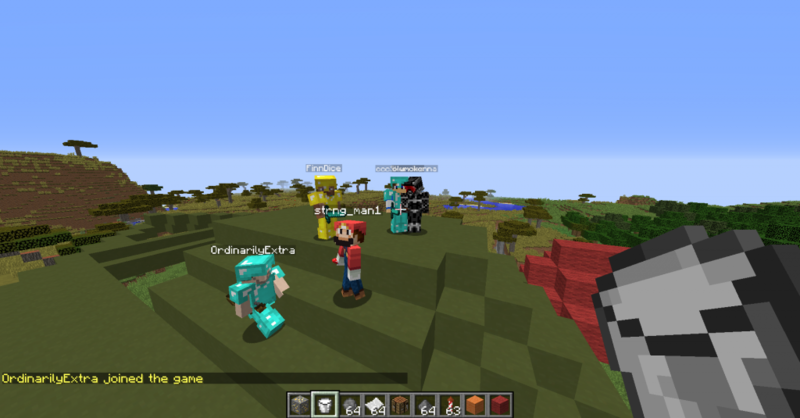 However, the advent of multiplayer games has added a certain unpredictability, and that is something I for one think is a very welcome development! 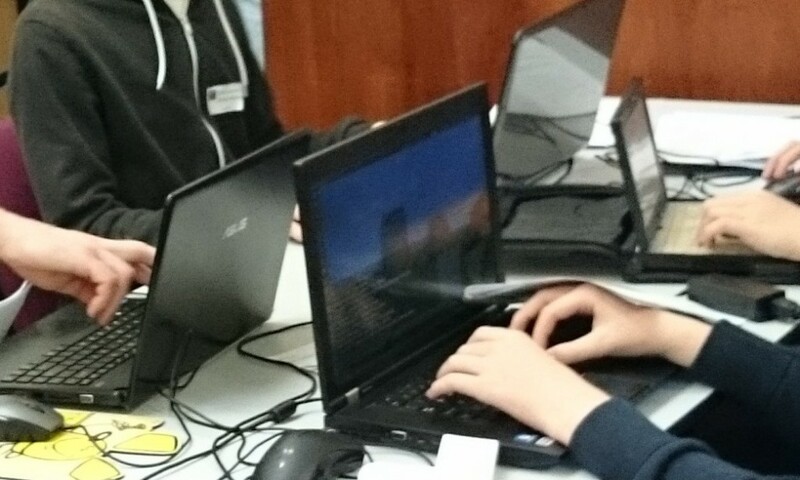 Since September 2014, up to 60 kids bring their laptops and a parent along to the monthly sessions of Skerries CoderDojo. Read on to see what it is all about, and how you could become part of it. Have you heard of CoderDojo, the free coding club for kids from 7 to 17, where, mentors with IT backgrounds volunteer in order to pass on their skills and passion to the next generation? If so, you are hopefully also aware that the CoderDojo bug, which started a few short years ago in Cork and is now an international movement, came to Skerries this summer. CoderDojo was founded in Cork in early 2011 by the then-Leaving Cert student James Whelton and Australian author and investor Bill Liao, Dublin was one of the first locations to start up regular Dojos, moving around a little before settling on the Science Gallery, Dublin 2, where it is still taking place most Saturdays. As an accompanying parent, I saw how much fun it was for the kids, and also how difficult it could be to plan for sessions, yet how rewarding. After just accompanying our son there for about a year, I finally got involved myself on a practical level. 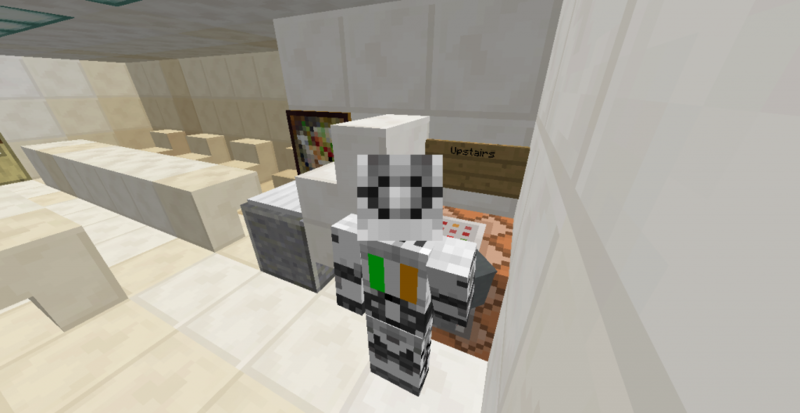 I led the Scratch Beginners & Intermediate group in the Science Gallery CoderDojo. I even got interviewed during that time – as did Ciarán! 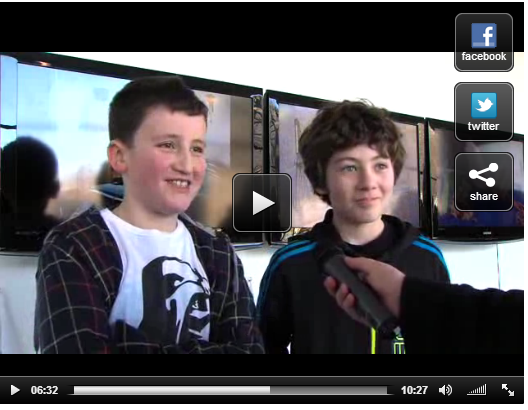 CoderDojo Video with footage from the Science Gallery (and Cork and New York) in 2012: Above all, be cool! Click on the link (screenshot) to see this video. ScienceGallery CoderDojo 2012. 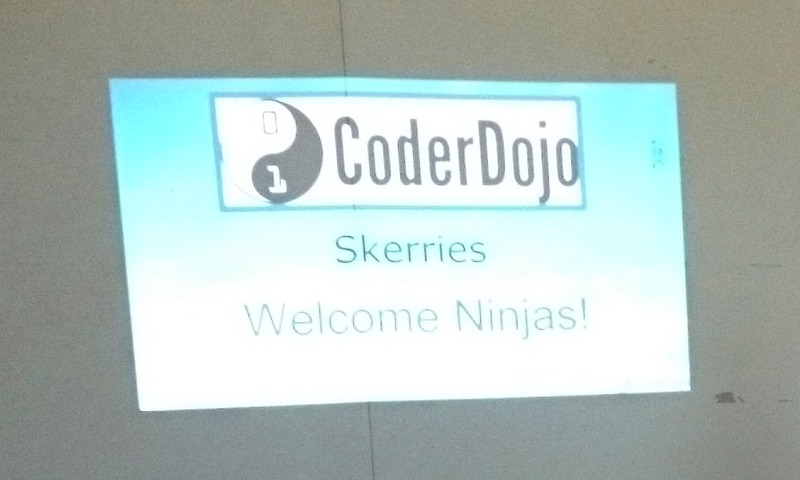 Jump one year forward to 2014, and it felt like the right time to bring CoderDojo to Skerries. Luckily, we got organisational support from Skerries Community Association, which really helped getting it off the ground fast. After a first meeting for interested people in June 2014, we started with regular monthly meetings that September, and have so far run four highly successful Dojos. At first Joe May’s very kindly hosted us in their upstairs room, but we soon outgrew this, and were lucky to secure the use of the Community Centre / Old Schoolhouse from November 2014 on. The buzz in the Old Schoolhouse on Dojo days is unbelievable! Three (soon four) parallel sessions and the Dojo Café in the Little Theatre fill the entire building. Between organisers / helpers and mentors, two dozen adults are actively involved – and more than sixty Ninjas attended the December Dojo. CoderDojo mentors use Scratch (and other programming languages / coding environments) to introduce children to computational thinking and coding. Both put huge emphasis on self-directed, problem-solving, and project-based, exploratory learning. Learning how to be active participants in the digital world, and making computers and the internet their tools for learning and creativity are other central aspects. The group of volunteer mentors and organisers who run Skerries CoderDojo is remarkable in its enthusiasm and willingness to help make the monthly meetings special, be it by providing for the Dojo Café, helping with the admin side of running such a club for so many, moving tables and chairs on the day, or preparing and running the sessions. We have parents and non-parents, men and women, people with computing backgrounds and others who are great at organising things. 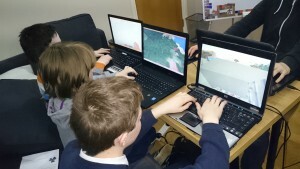 During the same session, the Intermediate Group learned how to establish what their computer’s internet address is, and to turn a single-user Scratch program into a chat room for up to four people. And it is showing already outside of CoderDojo. A lot of ninjas come to cccSkerries as well, and I can see how the monthly Dojos add an extra buzz to their digital learning, and make them eager for more. 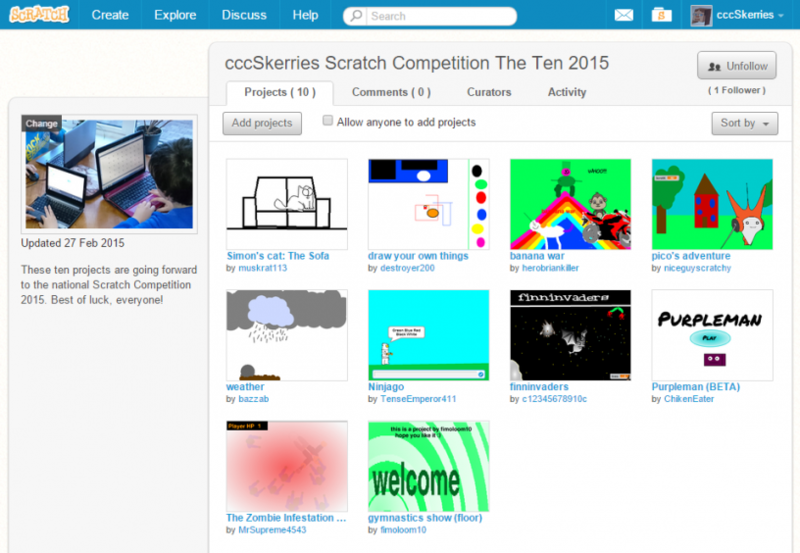 For more information on Skerries CoderDojo, have a look at our page on the Skerries Community Association website (Skerries CoderDojo is a committee of the SCA), or our Facebook page. If you’d like to join us as a parent helper / organiser or mentor, or just want to find out more, please send an email to coderdojo@skerriesca.com.